Value: Why Do We Lose Sight After the Season Starts? Archived Content Value: Why Do We Lose Sight After the Season Starts? There’s a purpose, or objective, associated with everything you do. You go to the gas station. Why? Because you need gas. Your car won’t run without it. You slip in your Madden disc for some gaming. Why? Because you want the enjoyment of seeing your beloved Browns actually win a game. Everything you do, there’s a “why”. And this notion isn’t ignored when it comes to fantasy football. Your purpose when entering a fantasy draft is to create the most valuable team possible. You want a team that scores the most points, week in and week out. You want the MVT (this has to be something Nelly would say, right?). The value of a player is determined not by the number of points he scores, but by how much he outscores his peers at his particular position. What does this mean? Well, the most valuable player isn’t the one who scores the most points. The most valuable player is the one who outscores the rest of his position by the most points. We can’t concern ourselves with how Aaron Rodgers performs against Ray Rice. What we should worry about is how Aaron Rodgers does versus someone like Tom Brady or Drew Brees. Value Based Drafting is based on projections. After all, how else would we determine how many points a particular player scores before the season starts? It helps you determine which player is the most valuable across all positions. But what VBD also suggests is which position, at a high level, is most important to fantasy football. Let’s use a hypothetical example. 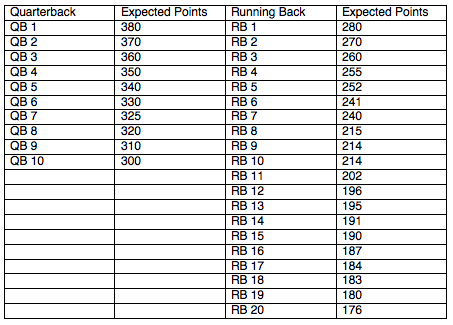 Below is a (fake) chart of expected point values for top-10 quarterbacks and top-20 running backs. The reason we use “10” at quarterback is because a typical 10-team fantasy lineup will be starting just one quarterback. And the reason we use “20” running backs is because, as you would guess, we start at least two running backs in that same league. These numbers don’t reflect anything real, but let’s use them to walk through the concept. The difference between the top quarterback and the 10th ranked one is 80 points. At running back, there’s a 104-point variation from best to worst. And while you could stop there with your analysis, concluding running backs are more important than quarterbacks, there are ways to look deeper into the idea. Why is this important? Because this is where the advantage at a position is created. This is the very last running back you take before you begin to lose a significant amount of points at the position. If you can get this running back then you’re in phenomenal shape, as the point decrease you’d see up until this point – compared to the top running back – is fairly minimal. To put this another way, everything left of this circle is your “tier 1 running back”. Everything to the right is your “tier 2 running back”. When you look at expected point values to determine VBD, you should see where the largest drop offs exist. This helps you tier players and accurately draft. For instance, if Aaron Rodgers was projected to score 400 points, and there were nine other quarterbacks projected to score 399, would we want to spend a first round choice on Rodgers? No, because you’re gaining almost no advantage by taking Rodgers that early. All of those quarterbacks would be in one giant tier. Generally, the more linear a line, the less important the position. There is a caveat to this, however. While the line may be straight, the point differential from point to point matters. As you move down the line of best player at a position, to second best, and so on, if the difference from each point is significant, then there’s still value at that position. In other words, if you’re decreasing at a rate of X – 3, and another position is decreasing at a rate of X – 7, the other position more than likely holds more value. The guys at the top matter more, and are less replaceable. This whole idea is why Aaron Rodgers, Drew Brees, Tom Brady, Matthew Stafford and Cam Newton were so valuable to fantasy last year – they were much better than the rest of the quarterbacks, aside from where they were drafted (which I’ve shown is incredibly important to this idea, and something many tend to ignore). The problem is that last season was the first time four quarterbacks had outscored their position by 100 or more points. It was the first time such a number of quarterbacks were in a large tier. And actually, in the past, there hadn’t even been three quarterbacks who accomplished this in one season. This just helped feed the idea of The Late Round Quarterback. The logic behind Value Based Drafting is that you are simply gaining a competitive edge at each position given the point output by a particular player. So why do people ignore this once the season starts? In the last section, I mentioned the idea of tiers. When there’s a huge drop in production from one player rank to the next, you begin a new tier. This is immensely important when you look at value throughout your fantasy season. For instance, you may be frustrated with Darren McFadden’s performance thus far. But when you compare him to his position, he’s in a tier that could be identifiable with Tom Brady’s tier at quarterback. If you don’t believe me, I’ll be doing an analysis similar to this next week to show just how the late-round quarterback strategy is doing, and why instances like this occur. The idea of recognizing these tiers is important to trading. Let’s use a quick example – and I’ll talk about tight ends to add some spice to this column. If you look at the position right now, you’ll notice some elite performers at the position. Tony Gonzalez is averaging 11.2 points per week, Gronkowski and Heath are at 10.2, and Owen Daniels is at 9.4. Unfortunately, just like nearly ever year previous to this one, the value isn’t very strong at the tight end position. A lot of this has to do with the fact that your lineup will typically feature just one tight end. If this is the case, which is the fact for many leagues, just 10 or so tight ends are being started each week. Replaceability. Is Tony Gonzalez replaceable right now? Probably not. But is Vernon Davis, the tight end with the fifth best average at the position? Yes. Upon further investigation, you notice that Scott Chandler is tied as the 12th best tight end. And, because you’re in a 10-team league, you know that this is outside of being a “starter”. Marques Colston is averaging the 5th most points at wide receiver. James Jones, on the other hand, is ranked 15th. Therefore, in your eyes, you’re still getting a “startable” receiver. You do the deal. Bad idea. While Colston is ranked 5th – just 10 spots higher than James Jones – he’s outscoring Jones by almost 3 points per week. 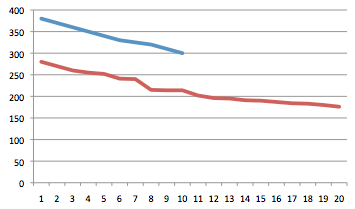 Vernon Davis, on the other hand, is outscoring Chandler by just over 2 per week. It’s just an example, sure, but it’s understanding these drop offs in production and the idea that rank doesn’t equate to value. Tight ends will rarely, and they historically have not, be worthwhile upgrades when you’re downgrading at a position like wide receiver or running back. If I were to draft a team that I could never, ever touch, then I would draft Aaron Rodgers, Tom Brady or Drew Brees in the first round. If I couldn’t trade or could only make a waiver claim when my team was hurt, that would be my first pick. Hopefully this causes some eyebrows to raise, but it’s because I’d sincerely “trust” those players more than I’d trust Chris Johnson. This doesn’t mean it’s worthwhile to get them. The assumption here is that your league is moderately active, and that you care a little bit about your own squad. There are quarterbacks on the wire who you can play weekly, and there are quarterbacks sitting on the bench for teams who own Rodgers, Brady and Brees. There are ways to obtain quarterbacks every week that will yield point totals that are not much less than a Rodgers, Brady or Brees. Since this is the case, it’s important to note that value and positional drop offs are slightly different with quarterbacks and tight ends compared to running backs and receivers. Teams with a riskier quarterback aren’t necessarily playing that quarterback every week. The same goes for tight ends and kickers. You’re starting just one of them in most leagues, and because of this, there are almost always players available to play the matchup game in free agency. And if there aren’t, your bench is more than likely deep, meaning you can still play matchups. The best example of this is with team defenses. How many of your league mates actually start the same defense every single week? It’s very rare, as the smart thing to do is play a defense by matchup. And in almost every league, you’re starting just one defense. People feel good about having Rodgers because they know they’ll get 20 points each week. But how’s this for a fun fact: Andrew Luck has outscored Aaron Rodgers in 3 of his 6 games played this season (Weeks 2, 3 and 5). So what? Isn’t that part of his value? That’s part of the reason Stafford is so poor of a play this year – his schedule is brutal. Why do we make excuses for them? The fact is, because the overall demand for the quarterback position is lower, you have more opportunity to play matchups and replace the player slotted in that position. In other words, the gradual drop-off in production at single play positions (where you start just one) can’t be analyzed at such a high level. The person who owns Andrew Luck, in the example above, probably didn’t start him in his first ever NFL game. Think about it. The idea is fairly simple, yet incredibly hard to articulate in a few sentences. In general, the game of fantasy football has so many different angles in which you can analyze data to the point where core fundamentals become completely lost. The word value seems to become irrelevant once a season starts. But why? As I noted above, it’s important to always remember where significant point drop-offs occur in position ranks. This helps guide your player tiers. It’s just as important, however, to remember that fantasy football is transaction-driven. You’re not simply drafting a team and not touching the team ever again. This is why single play positions are less valuable – they’re replaceable. Of course there are other circumstances to consider when you evaluate players. Is their schedule tough? Are they suffering from a lingering injury? Has their performance regressed? But the one word to remember throughout any analysis with fantasy football is value. You used it when you drafted, implementing the idea of Value Based Drafting – so why stop once the season begins? Continue to look for valuable plays. Find where those position drop-offs occur. Use player rankings to manipulate other owners. Create the MVT of your league.